11 year old Mohammad Mustafa, son of a poor farmer, is a student of 5th grade and lives in Larkana. 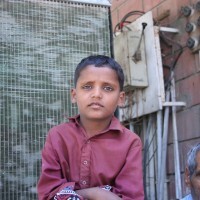 Mustafa’s teachers had expressed their concern to Mustafa and his father about his poor reading and writing abilities which they suspected was due to his eye sight. The father, who was illiterate, ignored these concerns as he thought that it was because Mustafa wasn’t interested in studies. But the major reason was Affordability. The school struck off his name due to poor performance. He was then admitted to a Govt.School but after a few days they also refused to keep him as he could not read the board or write properly. The Principal advised his parents to take Mustafa to LRBT ‘s Free eye Hospital at Gambat and get his eyes checked. The father now had no choice but to take Mustafa to LRBT, where he was diagnosed with bi-lateral congenital cataract and admitted on the same day for surgery which was successful. His father shed tears of happiness Mustafa has high aims and he does not want to adopt his family’s profession. Instead he wants to study and become a Police officer.